Hanoi People’s Committee has just released a statement falsely accused Hanoi Archbishop and threated to punish him severly. State media on Sunday evening carried a statement from Nguyen The Thao, the chairman of People’s Committee of Hanoi City in which he accused Archbishop Joseph Ngo Quang Kiet of inciting riots, falsely accusing the government, ridiculing the law, and disrespecting the nation. 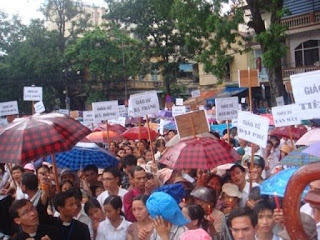 “On Sep. 19,2008, on behalf of the archbishop’s office, he [the prelate] signed ‘an urgent protest letter’ to the President and the Priminister with distortional information to falsely accuse the government disrespecting the law, challenging the state with words such as ‘We have our rights to use all of our capabilities to protect our property’,” Thao wrote. “After that, the archbishop’s office used loud speaker …to read the letter,” he added. “These behaviours of offending the law, going against the benefits of state and nation must be punish severly in order to defense our regime, to protect rights and legitimate benefits of the state and citizens,” he concluded. 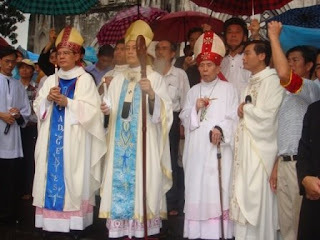 Thousands of Catholics demonstrated in Hanoi on Sunday morning following another protest of more than 5000 on Saturday evening, after the authorities began to demolish the Apostolic Nunciature and lay siege to several more church buildings. 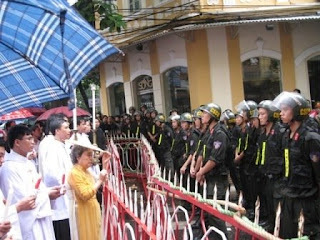 In what was the largest protest since the Communist takeover in 1954, Bishop Joseph Dang Duc Ngan of Lang Son and hundreds of priests led a march of more than ten thousand through the city to the nunciature where they set up an altar and statue of Our Lady in the street. The site has been surrounded by rolls of barbed wire and a police cordon with dogs. Inside hundreds of men worked round the clock to pull down the building and construct a library and a park while protesters sang hymns and prayed outside.